They say the way to a person’s heart is through their stomach. Well, the same can be said of a city. There is no better way to intimately experience the Catalan capital than through its tastiest eateries and rich culinary traditions. 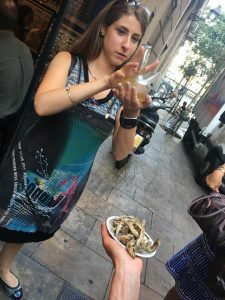 I was fortunate enough to attend Wanderbeak’s Savour Spain experience; a food tour which simultaneously satisfies your palate and allows you to explore Barcelona like a local. Your tour guide, in my case the charming Blanca, will guide you through the characterful winding streets of Barcelona’s old city. Surrounded by awe-inspiring gothic and modernist architecture, your guide will delve into their history and tell intriguing anecdotes from their past. 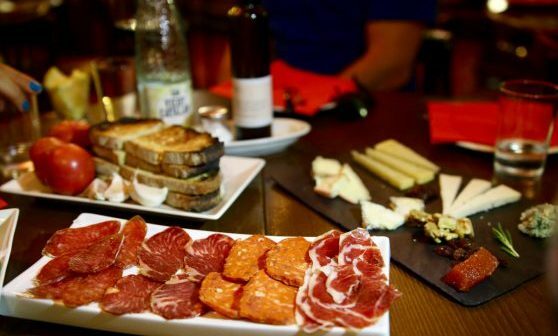 However, most importantly, several stops are made throughout the tour to enjoy traditional tapas, sampling culinary gems from Catalonia, Andalusia and Asturia. Our best advice is to come hungry, as the tour will cram breakfast, lunch, an afternoon snack and dinner into the space of four hours- don’t say we didn’t warn you! Your insight into the tantalising world of Spanish food begins on the prominent La Rambla, ready to enter the authentic colonial treasure, otherwise known as Hotel 1898. Here, you will learn the history of this unique and magnificent building, and its extraordinary transition from the headquarters of the General Philippines Tobacco Company to the iconic hotel that it is today. Only a stone’s throw away was our ‘breakfast’ spot, where we had the opportunity to try authentic Catalan cuisine- an ethos which they pride themselves on. All dishes are prepared with fresh, seasonal products, and sourced from local suppliers. We enjoyed a feast of asparagus fritters, marinated sardines and olives; washed down with a chilled glass of vermouth- the best I’ve ever had. Aromatic, fragrant, perfumed…this sweet and spiced wine, is simply a must (let’s ignore for now that this meal was considered our ‘breakfast’ meal of the tour). From here, we wandered over to Raval, “the trendy and upcoming” barrio of the city, to view the architectural marvel that is the Antic Hospital de la Santa Creu. As we strolled through the idyllic courtyard, the group was informed of various intriguing historical accounts of the location, including how Barcelona’s paragon, Antoni Gaudí, spent his final resting moments in this hospital. But, after a whole half an hour without food, lunch called. This old favourite amongst locals was chosen for its unassuming nature, and most importantly, its menu. 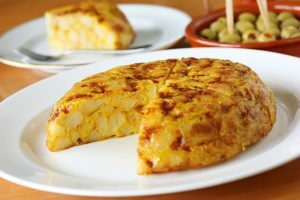 Consisting entirely of typical Catalan dishes, from tomato bread, chorizo, tortilla, padrón peppers to patatas bravas- its focus is solely on providing food true to its roots at a reasonable price rather than luring tourists in with overpriced imitations and plush decor. Following a quick detour back to La Rambla for a nougat taster, we headed for a coffee with an education at a cafe that had previously welcomed some of the greatest artistic minds of the twentieth century. We listened tentatively as Blanca walked us through the cafe’s fascinating history, namely how Picasso hosted his first exhibition under their roof. However, its dining room struck a chord with me for a rather different reason- its resemblance to the restaurant featured in Woody Allen’s romantic comedy, Vicky Cristina Barcelona. Upon route to our next sojourn, we were lured off route by the striking mural in Plaça d’Isidre Nonell, The World Begins With Every Kiss, and the plentiful Instagram opportunities that it posed. However, the idea of freshly made churros didn’t keep us for long. Piping hot, doughy and lightly sugared, they certainly hit the spot. As if that wasn’t enough, we popped to a couple of doors down to unite our churros with the perfect accompaniment. Two piping hot, silky chocolate sauces- one plain chocolate and the other chocolate orange- with the latter certainly giving Terry’s a run for their money. 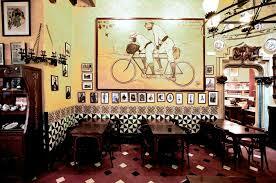 Ever wondered where the likes of Bono would dine on a trip to Barcelona? Look no further than the final stop of our tour. Having hosted the U2 star before kicking off their world tour at Camp Nou, we believe if it’s good enough for Paul Hewson, you’ll certainly enjoy this quaint foodie joint. 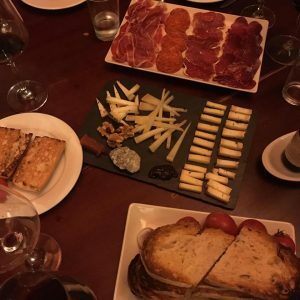 With its humble selection of only four tapas, it certainly doesn’t attract the local folk and tourists for its variety, but rather its expert quality and attention to detail. Its modest menu entirely consists of a tomato salad, botifarra, anchovies and sardines: all prepared and seasoned to perfection. Here, your guide will also to teach you the art of drinking from a porron (your guess was as good as mine before having the pleasure of the Savour Spain experience!). Last but by no means the least, the tour sadly came to an end in an idyllic setting, nestled away in the picturesque district of El Born. 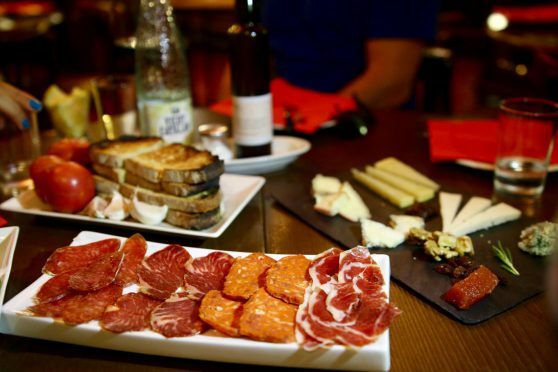 Simple Spanish cooking without the frills, an exquisite assortment of cured meats and artisan cheeses were presented, paired with fine Spanish wines. Yet, despite the superb food and wine enjoyed throughout the tour, possibly the greatest quality of the experience was its intimacy. With each group limited to eight people, composed of people from all walks of life, it’s easy to forget you’re not spending an evening with close friends, given the relaxed and sociable atmosphere of the tour. 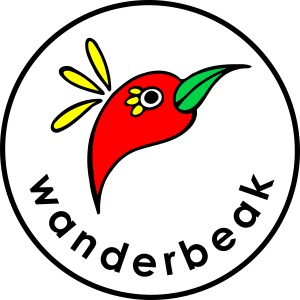 Indeed, if you’re seeking to discover the finest points of the city’s culinary scene whilst forming international friendships, Wanderbeak’s tours are certainly worth checking out for your trip to Barcelona. Win free tickets to the legendary Mobilee rooftop party in Barcelona!